By the end of 2012, the national debt per citizen will reach $52,222 for every man, woman, and child in the United States of America. But even more sobering and significant is the fact that the national debt per U.S. taxpayer will reach $144,539 for each and every American taxpayer. So while Mr. Obama portends to be fighting wealth disparity, what he has accomplished in all his efforts has only made every American citizen poorer. The public debt of the United States can be traced back as far as the American Revolution. In 1776, a committee of ten founders took charge of what would become the U.S. Treasury, and they helped secure funding for the war through “loan certificates” (equivalent to bonds) with which they borrowed money from France and the Netherlands. This committee morphed over the next decade into the Department of Finance. Robert Morris, a wealthy merchant and Congressman was chosen to lead the new Department of Finance in 1782. On January 1, 1783, the public debt of the new United States totaled $43 million. By 1792 the public debt had climbed to $80 million. The debt ratio, as a percentage of Gross Domestic Product (Debt-to-GDP), stood at just 34.6% in 1792. However, as of February 26, 2012, the gross public debt of the United States now totals $15.4 trillion, and the Debt-to-GDP ratio equals more than 100%. Of all the wars America has fought, none has been more costly than Obama’s War on Wealth. So what is the War on Wealth? How costly is this campaign compared to other wars? And when will it end? The rich must pay the same effective income tax rate as the poor and middle class. Another way of stating this would be simply, “There should be a flat tax levied on everyone based on gross income.” But in the War on Wealth, this is not the goal. What Obama really means is that the rich should pay a higher percentage of taxes, while 50% of working Americans pay none. The unemployed must be paid government benefits for up to three years or longer, at the expense of the federal government. The main problem with this theory is that it’s not the federal government that pays, but instead small business employers and working taxpayers have to pick up the tab. For example, under the 2011 Federal Unemployment Credit Reduction Rule, a $21 per employee tax was levied on employers in most states, while Michigan employers paid the highest rate at $63 per employee, the funds being used to pay for the last unemployment extension. I didn’t at all appreciate having to pay $21 for each active employee, to cover the unemployed who never worked for my company, especially since Georgia had already chosen to charge my company the maximum rate for State unemployment taxes. Of course, an even bigger problem with this theory is that every extension of unemployment benefits directly increases the duration of unemployment. The federal government must provide health insurance benefits for everyone. Once again, the main problem with this is that it’s not the federal government that pays, but rather it’s those who (if they are lucky) are barely able to afford to take care of their own health care needs, who are now being asked to pay even more to help those who can’t afford to pay for their own care. I can’t afford health insurance right now, because it costs too much. But I don’t want you to pay for my care; I want the government to get out of the market and increase free-market competition so that I will be able to afford it. For the time being, I am paying the cost of my own health care needs without insurance. The government must ensure that everyone who works hard should do well enough to raise a family, own a home, send their kids to college and put a little away for retirement. What’s wrong with this tenet? Well, first of all, how does one define the term “hard work”? Did a high school drop-out who works at McDonald’s work as hard to reach his or her goal as a PhD? Is everyone who has a job considered a “hard worker”? Based on my own work experience, I know that not everyone who works does so at the same level of responsibility, complexity or productivity. If all work were created equal, then when I was a low level accounting manager, I should have been paid just as much as the Comptroller and CFO, right? And when I was a mail clerk at a top accounting firm back in the 1980’s, I should have been paid just as much as the senior accountants and all the partners, right? Nonsense. And then, who’s to say that everyone wants to raise a family, own a home, or even has kids to send to college? I chose to get married and raise a step-son and three children of my own, but my next door neighbor has never been married and doesn’t have children. I later got divorced from my first wife and then chose to remarry and to help raise another three step-children in addition to my three kids. And I’m sorry to tell you this, but I’m afraid there are no shortcuts. Every individual is responsible for figuring out such matters on their own, just like my family, and our forefathers before us. My suggestion for anyone who wants to raise a family, own a home, and send their kids off to college, is that you take all of this into consideration while planning your future. And if you fail to plan, or if your plan fails, then don’t look to me or anyone else to bail you out, because we have our own lives to contend with. Our lives haven’t exactly been a piece of cake, but rather about making choices and then taking personal responsibility for our actions, the good, the bad, and the ugly. How much has the War on Wealth cost? Thus far, the War on Wealth has added another $6.4 Trillion (USD) to the national debt, which is more than any other debt spike in U.S. history. Yet this record level of borrowing and spending has delivered next to nothing in terms of results. Thus far, the war has sent our nation’s Debt-to-GDP ratio soaring from 69.9% at the end of 2008, to 104.8% in 2012. 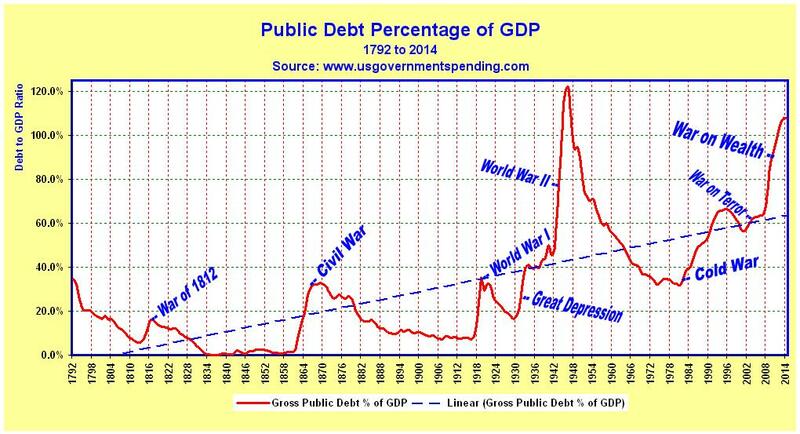 In fact, the last (and only) time that the United States’ debt-to-GDP ratio exceeded 100% was during World War II. But it only took 4 years to win the Second World War, while the War on Wealth has no end in sight. The War on Wealth won’t end until the government runs out of other people’s money. But once that happens, it will also spell the end of the United States of America. However, thankfully the War on Wealth appears to be backfiring. Recently, the focus has shifted from a feeling of guilt for failing to help the poor and needy, to most Americans, even many on the left, now inquiring as to where the $6.4 trillion, which Mr. Obama has borrowed, was spent. Where’s the money? That’s what Americans want to know. What Obama’s grand achievement has amounted to is a $20,329 increase in the per capita share of the national debt for every man woman and child in America, and even worse, an increase of $56,266 for every U.S. taxpayer. Has your personal income increased by $20,329, over the last four years (for each person in your household)? Probably not, but irrespective of whether it did, as a U.S. taxpayer, your share of future income taxes just went up by $56,266 courtesy of Obama’s War on Wealth. Barack Obama will have borrowed and spent $6.4 trillion during his 4 year presidency, which is more than any other president in U.S. History. He has borrowed and spent more than was required to fight any war America has fought in her great history, and many times more than was spent even during the Great Depression. Yet nothing has changed, no victory has been won, and no American is better off than they were 4 years ago. So just how bad is Obama’s deficit spending from a historical perspective? Let’s go back in time and compare. The War of 1812, also known as the Anglo-American War (1812 – 1815), was a military conflict fought between the forces of the United States of America and those of the British Empire. America declared war in 1812 for several reasons, including trade restrictions due to Britain’s ongoing war with France, the impressment of American merchant sailors into the Royal Navy, British support of American Indian tribes against American expansion, and outrage over insults to national honor after humiliations on the high seas. From a Debt-to-GDP Ratio of 5.8% in 1812, the ratio peaked at 16.2% in 1817 before subsiding, ultimately reaching a trough of 0.0% in 1835. During this period, the national debt increased from $50 million in 1812, to $120 million by 1817, but was subsequently wiped out entirely by 1835. In fact, the national debt was negligible from 1834 through1842, totaling between $0 to less than $10.0 million, an amazing feat considering that there was no income tax during the era. The American Civil War (1861–1865) was a civil war fought in the United States of America. In response to the election of Abraham Lincoln as President of the United States, 11 southern slave states declared their secession from the United States and formed the Confederate States of America (“the Confederacy”); the other 25 states supported the federal government (“the Union”). After four years of warfare, mostly within the Southern states, the Confederacy surrendered and slavery was outlawed everywhere in the nation. From 1.9% in 1861, the Debt-to-GDP ratio peaked at 32.9% in 1869 before subsiding. It would ultimately reach a trough of 7.3% in 1916. During the era, the national debt increased from $90 million in 1861, to $2.6 billion in 1869, and would ultimately reach $3.6 billion by 1916. Although the national debt had increased by 1916, the Debt-to-GDP ratio was lower due to a surge in GDP following the war. What’s interesting to note is that although a temporary income tax was imposed to pay for the war, it only existed between the years of 1862 and 1872. In fact, no income tax was imposed on American citizens from the founding of the nation until 1862, and no income tax existed between the years 1873 and 1912. World War I (1914 – 1918) was a major war centered in Europe that began on July 28, 1914 and lasted until November 11, 1918. It involved all the world’s great powers, which were assembled in two opposing alliances: the Allies (based on the Triple Entente of the United Kingdom, France and Russia) and the Central Powers (originally centered around the Triple Alliance of Germany, Austria-Hungary and Italy). These alliances both reorganized (Italy fought for the Allies), and expanded as more nations entered the war. Ultimately more than 70 million military personnel, including 60 million Europeans, were mobilized in one of the largest wars in history. More than 9 million combatants were killed, largely because of great technological advances in firepower without corresponding advances in mobility. It was the sixth deadliest conflict in world history, subsequently paving the way for various political changes such as revolutions in the nations involved. In January 1917, Germany resumed unrestricted submarine warfare. The German Foreign Minister, in the Zimmermann Telegram, told Mexico that U.S. entry was likely once unrestricted submarine warfare began, and invited Mexico to join the war as Germany’s ally against the United States. In return, the Germans would send Mexico money and help it recover the territories of Texas, New Mexico, and Arizona that Mexico had lost during the Mexican-American War 70 years earlier. Wilson released the Zimmerman note to the public, and Americans saw it as a cause for war. President Wilson spoke before Congress, announcing the break in official relations with Germany on February 3, 1917. After the sinking of seven U.S. merchant ships by submarines and the publication of the Zimmerman telegram, Wilson called for war on Germany, which the U.S. Congress declared on April 6, 1917. From 7.2% in 1916, our Debt-to-GDP ratio peaked at 32.6% in 1921 before subsiding. The debt would ultimately reach a trough of 16.3% of GDP in 1929. During the era, the national debt increased from $3.6 billion in 1916 to $23.9 billion by 1921, before resting at $16.9 billion in 1929. The national debt actually declined between 1921 and 1929 along with the debt ratio. The primary reason for this phenomenon was that GDP soared after implementation of the Mellon Tax Bill, which lowered the top personal income tax rate from 73% in 1919 to just 25.0% from 1925 through 1931. The Great Depression, although not a war, was a severe worldwide economic depression in the decade preceding World War II. The timing of the Great Depression varied across nations, but in most countries it started in about 1929 and lasted until the late 1930’s or early 1940’s. It was the longest, most widespread, and deepest depression of the 20th century. The Great Depression is commonly used as an example of how far the world’s economy can decline. The depression originated in the U.S., starting with the fall in stock prices that began around September 4, 1929 and became worldwide news with the stock market crash of October 29, 1929 (known as Black Tuesday). From there, it quickly spread to almost every country in the world. The Great Depression had devastating effects in virtually every country, rich and poor. Personal income, tax revenue, profits and prices dropped, while international trade plunged by more than 50%. Unemployment in the U.S. rose to 25% and in some countries rose as high as 33%. Some economies started to recover by the mid-1930’s. But in many countries, the negative effects of the Great Depression lasted until the start of World War II. From 16.3% in 1929, the Debt-to-GDP ratio peaked at 50.0% in 1940 before subsiding. The debt would ultimately reach a trough of 45.4% of GDP in 1941. During the era, the national debt increased from $16.9 billion in 1929 to $50.7 billion by 1940, before resting at $57.5 billion in 1941. 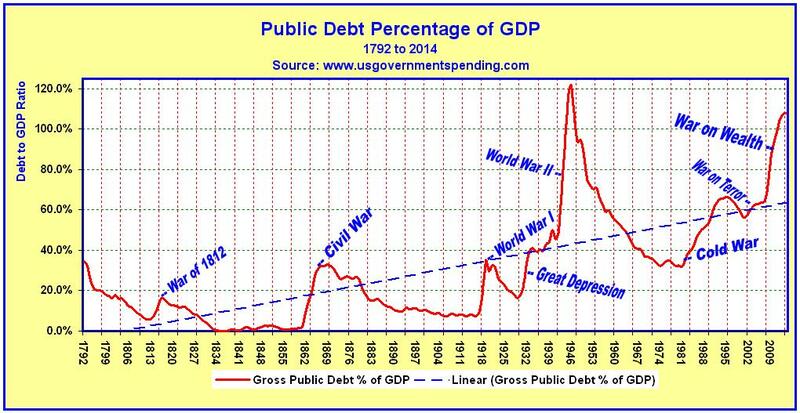 Although the national debt continued to increase from 1940 to 1941, Debt-to-GDP declined from 50.0% to 45.4% due to an increase in GDP related to the pre-war buildup. World War II was a global conflict that was underway by 1939 and ended in 1945. It involved most of the world’s nations—including all of the great powers—eventually forming two opposing military alliances: the Allies and the Axis. It was the most widespread war in history, with more than 100 million military personnel mobilized. In a state of “total war”, the major participants placed their entire economic, industrial, and scientific capabilities at the service of the war effort, erasing the distinction between civilian and military resources. Marked by significant events involving the mass death of civilians, including the Holocaust and the only use of nuclear weapons in warfare, it is the deadliest conflict in human history, resulting in 50 million to over 70 million fatalities. The United States didn’t formally enter the war until the Japanese bombing of Pearl Harbor on December 7, 1941. From 45.4% in 1941, the Debt-to-GDP ratio peaked at 121.9% in 1946 before subsiding. The debt would ultimately reach a trough of 31.8% of GDP in 1981. During the era, the national debt increased from $57.5 billion in 1941 to $270.9 billion by 1946, before resting at $994.8 billion in 1981. Although the national debt increased almost 4-fold from 1946 to 1981, growing from $270.9 billion to $994.8 billion, the Debt-to-GDP ratio declined from 121.9% to 31.8%. The decline in the debt ratio was due to an increase in GDP following the war. In fact, over this period, GDP increased 14-fold – growing from $222.2 billion in 1946 to $3.1 trillion by 1981. The Cold War (approx. 1945-1991) was a continuing state of political and military tension between the powers of the Western world, led by the United States and its NATO allies, and the communist world, led by the Soviet Union, its satellite states and allies. This began after the success of their temporary wartime alliance against Nazi Germany, leaving the USSR and the US as two superpowers with profound economic and political differences. The Soviet Union created the Eastern Bloc with the eastern European countries it occupied, maintaining these as satellite states. The post-war recovery of Western Europe was facilitated by the United States’ Marshall Plan, while the Soviet Union, wary of the conditions attached, declined and set up COMECON with its Eastern allies. The United States forged NATO, a military alliance using containment of communism as a main strategy through the Truman Doctrine, in 1949, while the Soviet bloc formed the Warsaw Pact in 1955. Some countries aligned with either of the two powers, whilst others chose to remain neutral with the Non-Aligned Movement. In the 1980s, the United States increased diplomatic, military, and economic pressures on the Soviet Union, at a time when the nation was already suffering economic stagnation. In the late 1980s, Soviet President Mikhail Gorbachev introduced the liberalizing reforms of perestroika (“reconstruction”, “reorganization”, 1987) and glasnost (“openness”, ca. 1985). This opened the country and its satellite states to a mostly peaceful wave of revolutions which culminated in the collapse of the Soviet Union in 1991, leaving the United States as the dominant military power. From 32.8% in 1981, the Debt-to-GDP ratio peaked at 66.1% in 1996 before subsiding. The debt would ultimately reach a trough of 56.4% of GDP in 2001. During the era, the national debt increased from $994.8 billion in 1981 to $5.2 trillion by 1996, before resting at $5.8 trillion in 2001. Although the national debt increased from $5.2 trillion in 1996 to $5.8 trillion in 2001, the Debt-to-GDP ratio declined from 66.1% to 56.4%. The decline in the Debt-to-GDP ratio was primarily due to a rise in GDP, which had grown from $3.1 trillion in 1981 to $10.2 trillion by 2001. 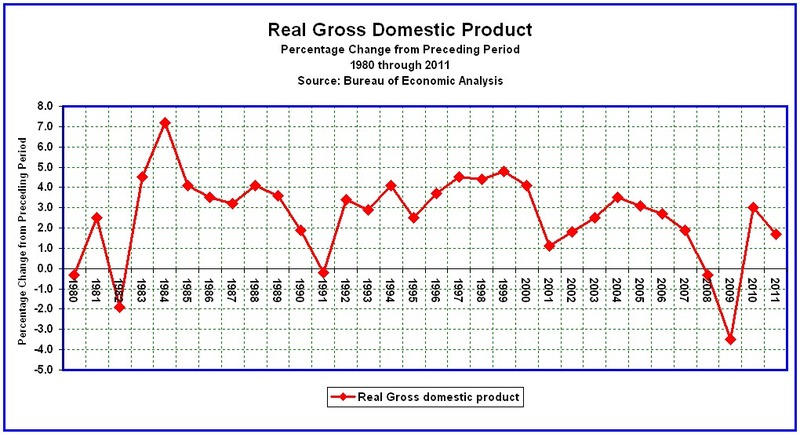 The growth in GDP was primarily due to Ronald Reagan’s Tax Reform Act of 1986. The War on Terror, also known as the Global War on Terror or the War on Terrorism (2002 to January 20, 2009), is a term commonly applied to an international military campaign led by the United States and the United Kingdom with the support of other NATO as well as non-NATO countries. Originally, the campaign was waged against al-Qaeda and other militant organizations with the purpose of eliminating them. The origins of al-Qaeda as a network inspiring terrorism around the world and training operatives can be traced to the Soviet war in Afghanistan (December 1979 – February 1989). In May 1996 the group World Islamic Front for Jihad Against Jews and Crusaders (WIFJAJC), sponsored by Osama bin Laden and later reformed as al-Qaeda, started forming a large base of operations in Afghanistan, where the Islamist extremist regime of the Taliban had seized power that same year. In February 1998, Osama bin Laden signed a fatwa, as the head of al-Qaeda, declaring war on the West and Israel, later in May of that same year al-Qaeda released a video declaring war on the US and the West. Following the bombings of US embassies in Kenya and Tanzania, US President Bill Clinton launched Operation Infinite Reach, a bombing campaign in Sudan and Afghanistan against targets the US asserted were associated with WIFJAJC, although others have questioned whether a pharmaceutical plant in Sudan was used as a chemical warfare plant. The plant produced much of the region’s anti-malarial drugs and around 50% of Sudan’s pharmaceutical needs. The strikes failed to kill any leaders of WIFJAJC or the Taliban. It was the 2000 millennium attack plots, including an attempted bombing of Los Angeles International Airport, the bombing of the USS Cole in October 2000, followed by the September 11, 2001 attacks, which led to a declaration of war. The War on Terror officially ended on January 20, 2009, when it was reduced to an Overseas Contingency Operation, and with commencement of the War on Wealth. From 56.4% in 2001, the Debt-to-GDP ratio peaked at 69.9% in 2008. During the era, the national debt increased from $5.7 trillion in 2001 to $9.9 trillion by 2008. The debt has since skyrocketed as a result of the new War on Wealth. Although the gross public debt increased by $4.2 trillion, from 2001 through 2008, expanding from $5.7 to $9.9 trillion, it has subsequently burgeoned by another $6.4 trillion in half the time, since the commencement of the War on Wealth. From 2009 through 2012, the federal debt will have ballooned from $9.9 trillion to $16.3 trillion. The debt will ultimately reach a peak of 104.8% of GDP by the end of 2012, and is expected to increase to 107.8% by the year 2014. What is significant about all of these great debt spikes in American history is that it took 189 years (1793 to 1981) for the national debt to reach $994.7 billion, an average increase of $5.2 billion per year. From there on it took just 20 years (1982 to 2001) for the debt to rise by another $4.8 trillion, an average increase of $238.7 billion per year. Subsequent to that, it took a mere 7 years (2002 to 2008) for the debt to grow by another $4.2 trillion, an average increase of $602.3 billion per year. Compared with the former eras, the federal debt has surged by another $6.4 trillion just since January of 2009, which amounts to an average increase of $1.6 trillion per year. With federal borrowing now completely out of control, one can only wonder who’s really benefiting from the War on Wealth, and when it will come to an end. What Obama’s grand achievement has amounted to is a $20,329 increase in the per capita share of the national debt for every man woman and child in America, and even worse, an increase of $56,266 for every U.S. taxpayer. Has your personal income increased by $20,329, over the last four years (for each person in your household)? Probably not, but irrespective of whether it did, as a U.S. taxpayer, your share of future income taxes just went up by $56,266 courtesy of Obama’s War on Wealth. By the end of 2012, the national debt per citizen will reach $52,222 for every man, woman, and child in the United States. But even more sobering and significant is the fact that the national debt per taxpayer will reach $144,539 for each and every American taxpayer. So while Obama portends to be fighting wealth disparity, what he has accomplished in all his efforts has only made every American citizen poorer. Well, we have a choice, we can either wait for the next recession, or the next genuine war, either of which will surely bankrupt our nation, or we can end the War on Wealth once and for all, in November of 2012, by simply voting Obama out. It’s time to stop playing games and time to get serious about America’s future. When Mr. Obama visited the padlock maker Master Lock in Milwaukee, on February 15, 2012, he drew the following conclusions. He said, “Manufacturing is coming back. Companies are starting to bring jobs back. The economy is getting stronger. The recovery is speeding up. We’re moving in the right direction. And now we have to do everything in our power to keep our foot on the gas.” So in keeping with my fact based approach, I have to ask, Are Mr. Obama’s claims reasonable? Let’s run down the list. 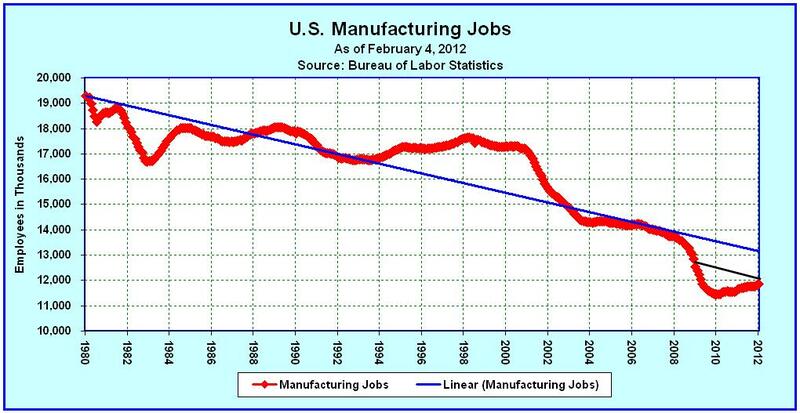 First of all, in my last post, War on Wealth | Obama Visits Master Lock, I pointed out that the United States has lost more than 6.0 million manufacturing jobs since 1990, and almost 1.0 million of those have been lost since Obama’s inauguration (see chart above). 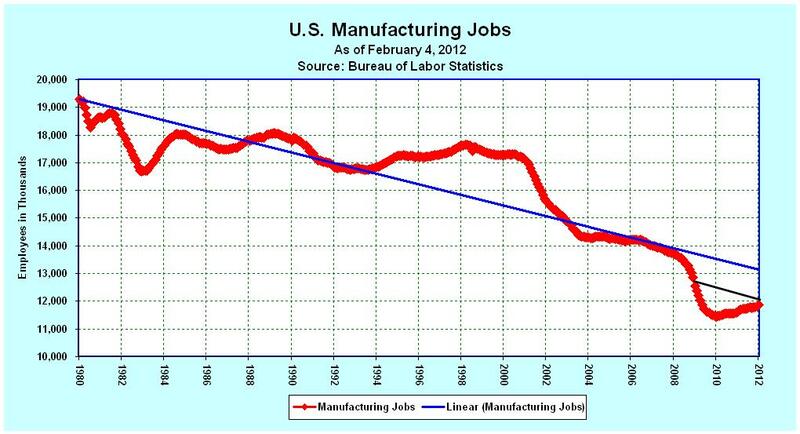 That’s hardly indicative of a manufacturing boom. And since Master Lock only brought back an alleged 100 jobs from China, that’s hardly proof of companies bringing jobs back. It would have been more accurate to state, although less of a reason to re-elect Mr. Obama, that one U.S. company brought back 100 jobs from China. Next, according to the Bureau of Economic Analysis, GDP declined at an annual rate of (3.5%) in 2009, increased at an annual rate of 3.0% in 2010, and then slowed to an annual rate of just 1.7% in 2011 (as of 1/27/2012). So since our economy declined from an annual growth rate of 3.0% in 2010, to an annual growth rate of just 1.7% in 2011, does this mean the economy is getting stronger? Not in my book. So instead of backing Obama’s claim, that the recovery is speeding up, the facts show that the recovery is actually slowing down (see chart above). Are we moving in the right direction? Well, in terms of deficit spending, the government is borrowing at the highest rate of GDP since World War II, as shown in the chart (above). The national debt as a percentage of GDP has skyrocketed from 69.9% in 2008 to 104.8% in 2012, and is projected to reach 107.8% by 2014. 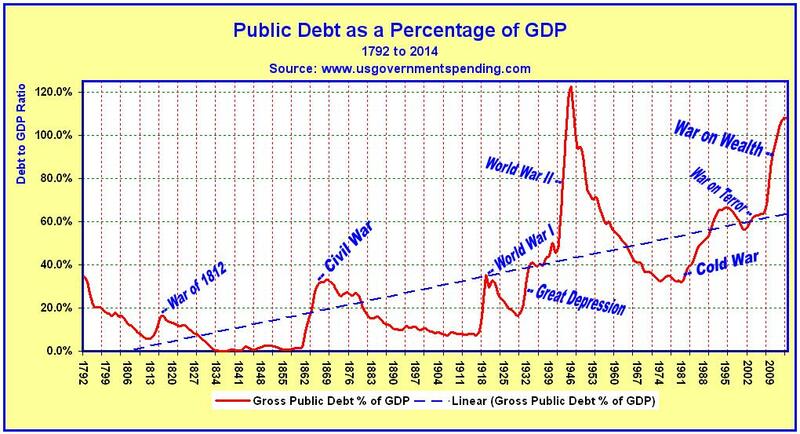 The last time our debt-to-GDP ratio surpassed 100% was in 1945, when the federal debt climbed to 116.6% of GDP, peaking at 121.9% in 1946. We know where the money was spent during the Second World War, but where’s the $5 trillion Obama borrowed and spent? For God’s sake, we could have cured cancer, or built a colony on the Moon with that kind of dough. In terms of the near record debt-to-GDP ratio, coupled with the continuing loss of manufacturing jobs and the year-over-year decline in GDP, I conclude that the United States is moving in the wrong direction. 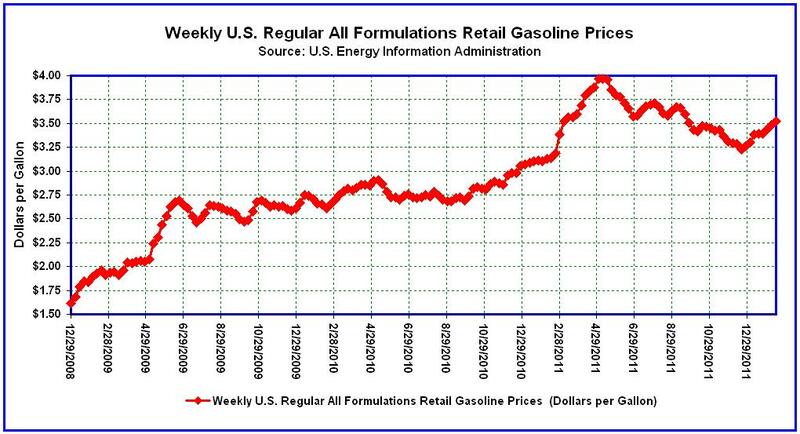 According to the U.S. Energy Information Administration (EIA), gasoline prices have risen from an average price of $1.61 in the week ending December 29, 2008, to $3.52 through the week ending February 13, 2012 (see chart above). So since gasoline prices have risen by 118.6% under the Obama Administration, perhaps we should be doing everything in our power to remove the federal government’s dead cold foot from the gas pedal. 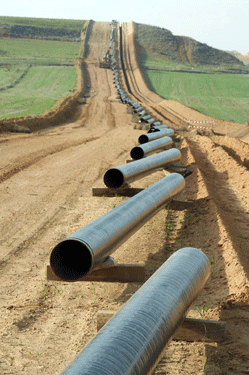 Gasoline prices are expected to rise further, to $4.50 per gallon by this summer, which may give Mr. Obama a temporary victory in his War on Wealth, but fortunately for America, his chance of re-election will simultaneously run out of gas.